Transform any room and change the ambience with this colour changing LED bulb. With the provided remote control, choosing from a range of colours and programs is made quick and easy. Simple plug in lamp - just what we wanted! The shade will move through 360 degrees. Nice! However it's not supplied with a bulb. 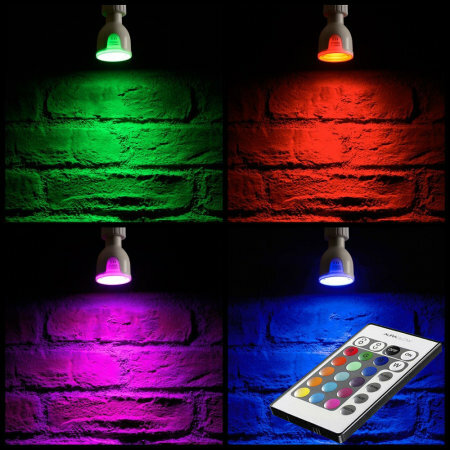 This product ,with or without the colour changing bulb is ideal as an uplighter.But with the colour changing bulb, you can illuminate an area for whatever your mood takes you. With the ability to be able to angle it vertical, downwards or horizontal, you can illuminate where you like. So good I bought 2, and you can have each one a different color in the same room.....groovy! Ideal for our small dining area. Now thinking of getting more, as they’re really good for different lighting feels in small AND large spaces. Good for hallways/landings and to shoe off pictures .. all my friends have ordered since seeing mine! ???? Good value price wise , bought one a while ago very pleased with it. Love this light. Goes well with the uplighter I bought too from Mobile fun, and the remote does the job, responsive. Colour is easy to select and can be dimmed down a bit.also the colour can be changed automatically, maybe when party season starts again, might come in handy! Very stylish and gives a good warm light in the evenings in those darker places in the living room, very nice. You can still access both plugs and switches on a std uk twin socket too. Bought it to go behind my corner settee,for a little bit of light ???? This item is a must have for any home. Connect it to a smart plug and Alexa adds more functionality. Love it. It's a case of personal taste but I didn't think much of them. It's a case of personal taste but I didn't think much of them. Perhaps better if supplied with a better choice of LED lamp? Pleased with this product as it does exactly what we bought them for. They certainly help set the mood for the evening. It wasn't totally clear if a bulb was included but no problem that it wasn't. However, I'm going to change the standard GU10 bulb that I purchased for a Hive GU10 bulb so I can remotely change the brightness. The ability to change the brightness will mean I can dim the light down low as a night light or adjust it up to a reading light. Fantastic by my bed where space for a lamp is ridiculously limited. What surprised me was the build quality. It's excellent and the impact very impressive. Easy to fix,adjustable angle,no batteries,can be moved around. Product exactly as specified. Nothing to come unstuck or holes drilled. The light does what its meant to do but i dont like the effect when its switched on. The plastic looks see-thro and marbly. I have a white bulb in it but the plastic case still looks yellow when switched on . I got this as it was good value price wise and wasn't disappointed when it arrived. I had to order a seperate bulb in the colour I wanted but it looks good. I was quite clear about the uplighter and their specifications before ordering them. This light is perfect in my hall, exactly what I was looking for. These were ideal for providing a bit of ambient light in my conservatory. Just what I was after. electrical/lighting stores and they don’t have them. So the plugs i bought from you are of no use at all. Easy to fix, just plug in. Base swivels so can be placed facing any direction. Works great with Hue Hub colour GU10 bulbs and Alexa. Would definitely recommend. GREAT BIT OF KIT ! These make brilliant Night Lights, and also great Mood Lighting. Would be excellent, if it had some kind of remote switch. Still useful for the kids or elderly, in the passage or stairs, if you don't want too much light at night. Backdrop so to speak. I love these uplights.I got rid of my small lamps as they were always falling over.And i wont have to dust them anymore. I have used them in all the rooms.They give lovely soft lighting. Would recommend. Smart if emply plug socket available. Need an empty plug socket available. No good using a plug socket adapter. Coloured bulbs are pricey. Would be great if bulb could be purchased as well. Great for lighting up dark corners, very effective and great for the money!